It was the best of times, it was the worst of times… or to put it more accurately, it was a mildly annoying time, it was a great time. That fairly surmises our recent visit to The Colca Canyon in southern Peru. 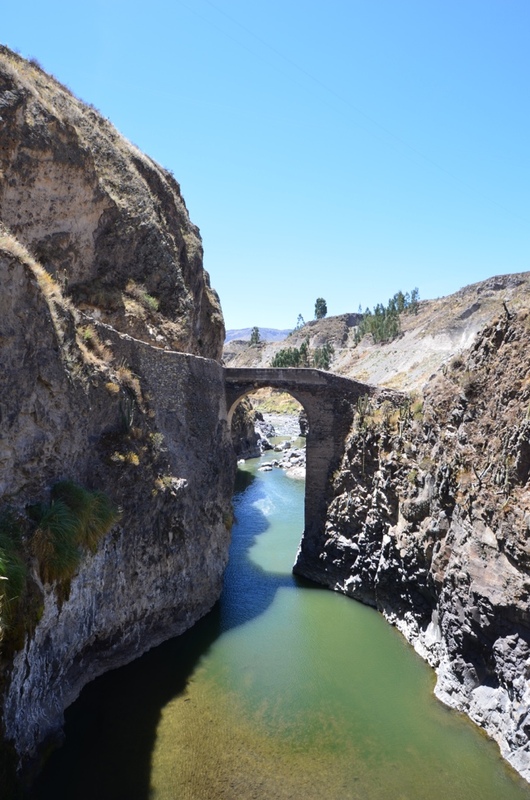 The canyon itself is spread along 70 odd kilometres between the towns of Chivay and Cabanaconde. Chivay is the first stop when traveling from the main southern city of Arequipa and is also the regional capital and administrative centre of the canyon. As such it is the obvious place to start ones exploration of the area. Unfortunately, this is a foolish assumption. Although the town is well served with amenities, it is not attractive nor situated to easily travel into the canyon. At Chivay, the start of the world ‘s second deepest canyon is nothing more than a small, narrow valley with a river running through it. We rented bikes to get out of the town and explore the surrounding villages which were raved about in tourist offices and guidebooks alike. Unfortunately these villages, much like Chivay offered little in the way of picturesque views or welcoming locals. The view from the bridge west of Yanquay – the canyon starts to get deeper but remains far from the world’s second deepest. The next day we took the sensible decision and boarded a local bus to Cabanaconde, having decided to leave early and stop at the Canyon’s deepest point in the hope of sighting the giant Andean Condors that can, if lucky, be spotted. We were both very lucky and very unfortunate. Like the hundreds of others that had come out in the hope of seeing a condor, we were not disappointed – largely due to the local tour guides arriving several hours earlier to put food out for the birds. However, being the photographic whore that I am, a photo is a photo, whether set up or otherwise. 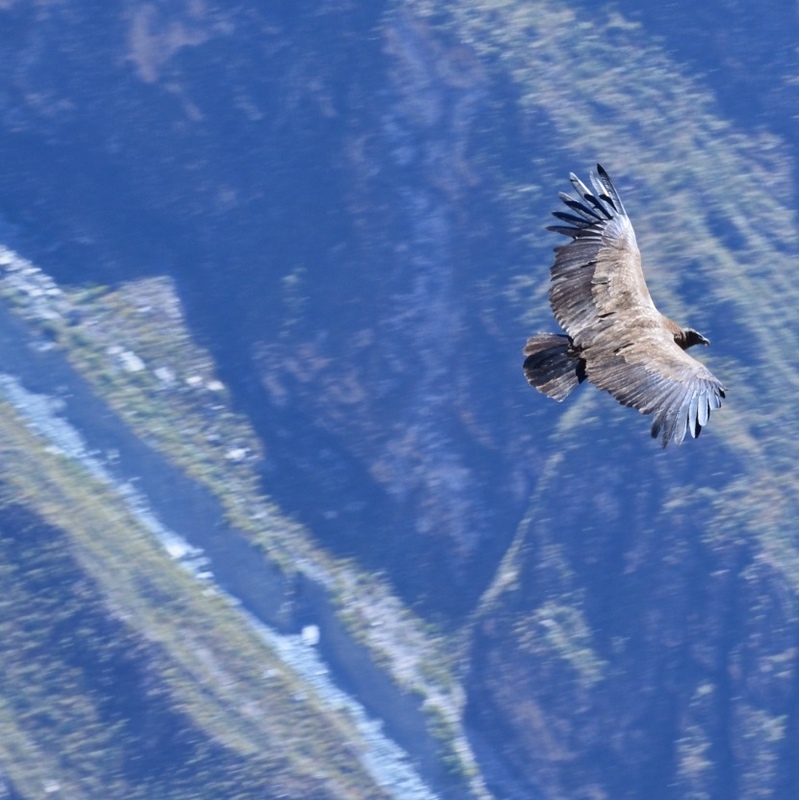 A female Andean Condor circling on a early morning thermal with the canyon and Rio Colca far below. After that, we were frustrated to find that the next bus wasn’t for another 4 hours and so, in the 30 degree heat we set off on the 14km trek to Cabanaconde. Predictably, we arrived just in time for the bus to pass us! Cabanaconde, being much smaller than Chivay and barely even a village had none of the amenities offered in its larger cousin, but it’s one bar/restaurant had a great vibe and the fact that everyone was forced to go there gave it a great village pub feel. The hamlet also differed from Chivay in that just 20 minutes walk from the main square and you were looking down an almost vertical precipice into the Canyon itself, and a proper canyon to boot. All in all it was yet another great experience that Peru offers it’s visitors and the Canyon gives amazing views and spectacular photographs, even if it is spectacular in a stunningly bleak not beautiful way. One word of advice – don’t waste time on the villages or towns – as with all canyons, it’s about the natural and anything man made rarely improves it. 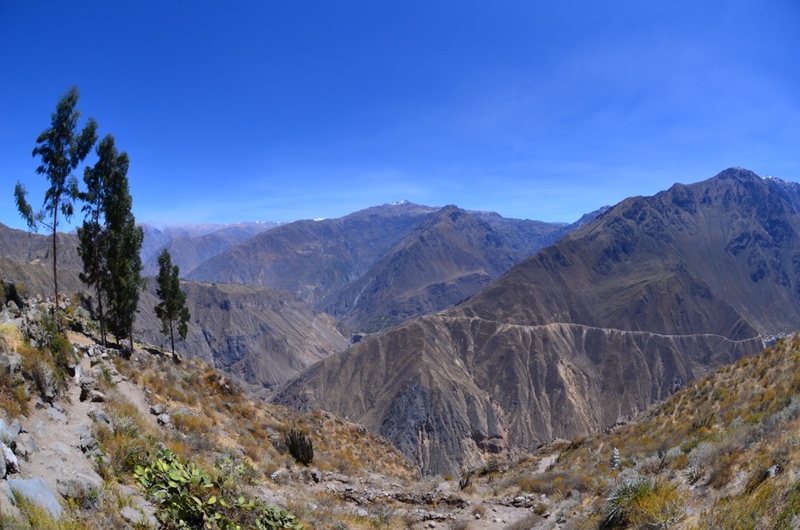 The view from the ‘outskirts’ of Cabanaconde, with the near vertical drop of the canyon wall in the near distance.